Dutch PA company Ampco Flashlight Rental recently selected Allen & Heath’s dLive S Class system for an annual concert at Amsterdam’s Johan Cruijf Arena for renowned pop group, Toppers. Formed by famous Dutch singers, René Froger, Gerard Joling, Jeroen van der Boom and Jan Smit, the band performed in the round on two consecutive nights, in a sing-along event that has been staged every year since they formed in 2005. 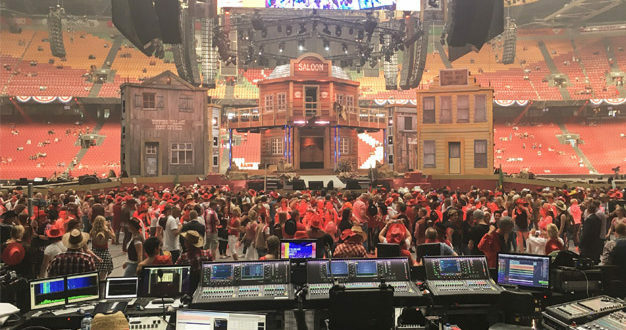 This year, the band’s long-standing FOH engineer, John Kriek, selected a dLive system for the first time, comprising two S7000 and a S3000 Surface with three DM64 MixRacks and two DX32 Expander racks for FOH, fitted with several gigaACE and Waves3 network cards. The gigaACE cards were used to create digital audio splits between the three systems and the Waves3 modules were used for live recording, backing track/click playback and plugin processing. One S7000 surface was employed to mix the band, the other was for vocals and melody instruments, and the S3000 managed pre-recorded backing tracks and orchestral samples. 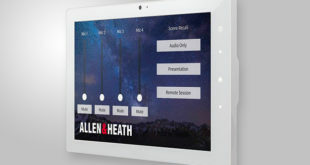 All three dLive surfaces utilised their 96kHz AES3 outputs which were fed to a loudspeaker management system. 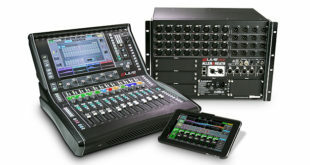 A ME personal monitoring system comprising three ME-U hubs and twenty-one ME-1 personal mixers was also used for artist monitoring on stage.